Russian voters across the country and abroad headed to the vote centers to elect a new president for the country. Russian President Vladimir Putin casted his vote at the Russian Academy of Sciences in Moscow on Sunday, according to Russian Sputnik agency. Eight contenders compete in the Russian presidential election on top of them Russian President Putin who enjoys the highest popular support. Some 110 million Russian people are eligible to cast their votes, including 2 million abroad. 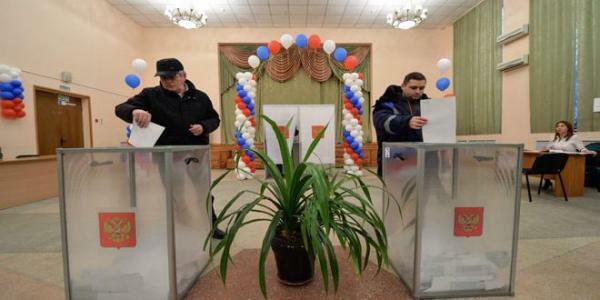 Some 97,000 ballot stations are opened in Russia, and another 400 polling places are established in 145 other countries. More than 1,500 foreign observers have been accredited to monitor the Russian presidential election, including a delegation representing the Syrian People’s Assembly. The participation of a delegation from the Syrian People’s Assembly in keeping up with the Russian presidential election came upon the invitation of the Russian parliament.